It is quite easy to disable, enable or modify the sound theme in Windows 8.1/10 for example Play Windows Startup sound! 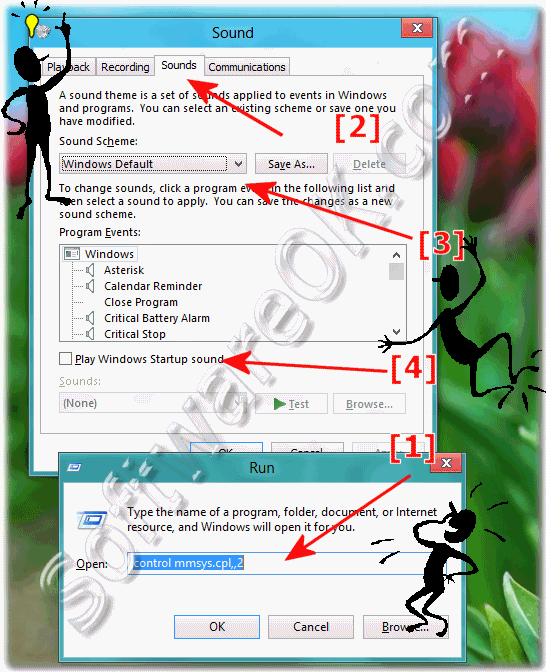 Open the "Sound Panel" in Windows-8 (8.1, 7) with the key combination [Windows-Logo]+[R]. In Windows-8 RUN-Dialog enter the command control mmsys.cpl,,2 and press ENTER. Or: Start the "Control Panel" and click or tap on the Ico "Sound"( ... See image-1 Arrow-1 ) . In the tab Sound ( ... See image-1 Arrow-2 ) you can find the options for the sound-theme (scheme) in Windows 8 (8.1) and the Disabled options ( ... See image-1 Arrow-3) and the option to activate / deactivate the "Play Windows-8 startup sound" ( ... See image-1 Arrow-4) . (Image-1) Modify, customize or disable Sound Theme in Windows-8 and Windows-7! A sound theme is a set of sounds applied to events in Windows and programs. You can select an existing scheme or save one you have modified. To change sounds, click a program event in the following list and then select a sound to apply. You can save the changes as a new sound scheme. [Windows Logo] + [D] to see the Win-8 desktop. Click with the right mouse button on the Windows 8 Desktop and select "New" >> "Shortcut". In the edit-field, enter the command called: control mmsys.cpl,,2, as the name e.g. Sound-Theme. Or use: RUN COMMAND and add command control mmsys.cpl,,2to favorites. PS: Via the Windows-8 Control Panel »» Sound you can also adjust the sound scheme in Windows-8. See also:... How to create a desktop shortcut for the Windows 8 onscreen keyboard? Overview of the sounds in Windows sound scheme-8! Windows-8 - FAQ-84: Sound theme in Windows 8.1 / 10 how to modify, customize or disable?